It is said that time is a great healer, but despite three months having lapsed since Mohammed passed away, this grim reality has not sunk in yet, as I write a tribute in his memory. I first met Mohammed Chinoy when he joined our Firm as an Internee and indicated at the outset that he was interested in litigation work, which brought him under my supervision. Mohammed went back to UK and after completing his LL.B degree from University of Kent was called to the Bar from the Lincoln’s Inn and returned to Pakistan as a Barrister to practice law. His first choice was our law Firm and during his almost 11 years with the Firm, he blossomed into an astute lawyer. I knew Mohammed socially but my first proper meeting with him was when he turned up one day in my dorm room in London. True to form he had booked his place at the last minute and was scrambling to find a permanent room in the dorm. He eventually found a room two doors down from me and so began one of the most cherished friendships of my life. That was characteristic of Mohammed’s way of working: show up late, scramble hard and hope that chance would lend a hand (which it always did in his case). Chance and luck always seemed to be on his side and he relished projecting an image of random good natured chaos; never being on time and leaving an incredible mess everywhere he went. Mohammed Chinoy .. a man of principle...our buddy.. my brother and one of my closest friends. Mohammed and I first met in our halls of residence in London. The first time I met him.. I thought to myself 'this guy can talk more than anyone I know..and nonstop'! And that was the beginning of a very special friendship.. one that I will cherish lifelong. The first thing that drew me to him was his warmth.. and genuineness. There was no pretence or nothing put-on about him.. he was a very affectionate person but always seemed a little shy to show it.. and that was the charm of our Mohammed. Mohammed was a wonderful person. If he liked you then he was your friend for life. And if he felt someone was a little hoity-toity.. he would make this really funny face and say 'I don't like him/her'! He once told me that he turned his desk at work the other way round because the person sitting in front of him annoyed him! He had this childlike way of making everything seem so simple.. of simplifying the complexities of life. When with him.. nothing seemed too bad. He always brought a smile to his friends faces and made us all laugh with his jokes and sense of humour. In 1998, a group of Pakistani twenty-one-year-old students arrived in London to spend the next year qualifying as Barristers. We soon found each other and formed a small close-knit group of friends. We spent most of the next year together—in and out of each others’ apartments, classes, and across countless meals and evenings shared together in a foreign country. Among this group was our friend Mohammed Chinoy, or “Chins” as we knew him. Chins was a force of nature. Always late, often frazzled, yet perennially in a good mood and always ready with a quip or a joke. I don’t recall ever seeing him angry or upset—instead he was to be found smiling cheerily with (usually self-created) chaos swirling about him and holding forth with his seemingly inexhaustible supply of aphorisms! Yet there was substance to Chins. Not just intellect, but character. Two qualities always stood out for me. First, his love and dedication to his family. A fierce and protective love for his mother and sister, and a wistful longing for his father who had passed away. Second, his single-minded dedication to Pakistan. 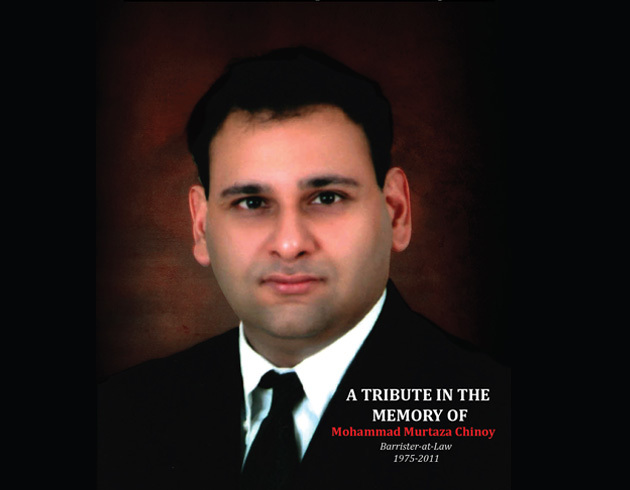 “MC” as Mohammed Chinoy was fondly known to Shermine and I, was a dear friend to us. We still find it difficult to believe that he is no longer amongst us, but I was reminded of the fact when I visited his grave in Karachi last week. We have been friends with MC for over a decade and throughout he was an extremely fine and abundantly principled person and a truly loyal friend. I repeatedly reminded him and others of my conviction that he would be one of Pakistan’s finest legal minds. That regrettably was not to be. His untimely death and the circumstances of its occurrence is a reminder of the galloping social and moral decay that is eating its way through Pakistan and the sustained breakdown of law and order. I believe that this points in the direction of the larger culprit - lack of education. MC is an unfortunate victim of this decay, an unnecessary loss of a life which had tremendous potential and ability. This decay needs to stop so that we do not lose loved ones like MC in such tragic circumstances. I thought long and hard about what to write to pay tribute to my friend Mohammed (MC for everyone at Orr, Dignam). I have decided to share an incident that happened about 10 years ago. The incident was very ordinary but a true reflection of the kind of person he was. In those days, we used to regularly play cricket amongst the lawyers and staff members of the Firm and sometimes with other teams as well. We had organised an internal cricket match on a saturday for which a cricket ground near our office was booked in advance. When we all got to the ground, we found to our surprise that there were already teams on the ground. These guys had simply invaded the ground and refused to leave despite our best effoerts and reasoning. We told them that we had paid and booked the ground but they would not listen and carried on playing. The invaders were basically a bunch of hooligans and troublemakers and we were really no match for them. Barrister Mohammed Murtaza Chinoy since childhood was a very caring and loving human being. He loved to laugh and make everybody around him laugh. He had a photographic memory and was very intelligent. While in high school in the U.S.A he sat for his Advanced Placemat exam, reaching 40 minutes late for the exam, as he over slept, yet he scored the highest grade in the whole of the United States. Mohammed got into a university in the U.S which was especially for gifted youngsters. In his 1st semester he got very sick and had to return to Pakistan to his family. As luck would have it he applied for the law course in the UK and began his legal education. When he graduated from Lincolin’s Inn and went for a job interview in the UK, he was asked “why did he become a lawyer?” Mohammed responded, “my father said I talk too much, so I may as well get paid for it”. So began his life as a lawyer. He loved arguing in Court and standing up for what he believed in. Best friend’ is one of the most extensively and freely used phrases in this world. Little children use it to refer to their first friends at playschool and the term rallies through life when even parents and grandparents use it liberally. We met somewhere in between these junctures of life, in what turned out be the most formative years. Young, ambitious, aspiring and fresh at Freshers week at university over 16 years ago. No one will ever doubt what super fun you were. Ever ebullient and always lightening the tone and putting people at ease. You were an absolute joy and never did that radiance cease to shine, even in highly troubling times. What the laughter and incessant joking concealed was one of the finest minds I have ever known. With great acuity and enormous depth you conquered intellectual discussions with ease. Seems a fitting career you chose as a Barrister. Subscribe now and SAVE. 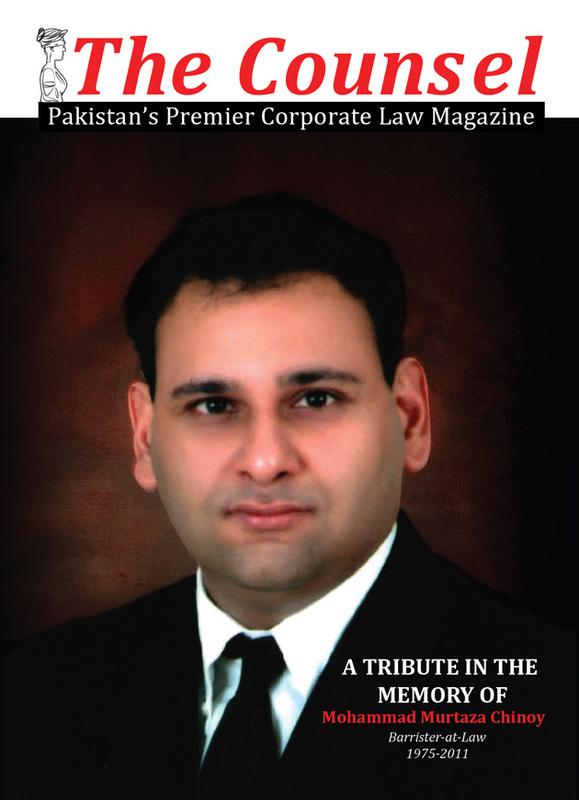 Sign up and receive The Counsel – Pakistan’s Premier Corporate Law Magazine, at a special starting rate starting from Rs. 500 for 1 year (4 issues). Readers are invited to submit their views and feedback on legislation, legal and corporate developments. Papers should: (1) Focus on any aspect of corporate law or recent development in corporate sector. (2) Not have been published in or submitted to another journal or newsletter, or be available online, subject however to prior permission.